You need a referral to an LGBT/HIV-friendly attorney? 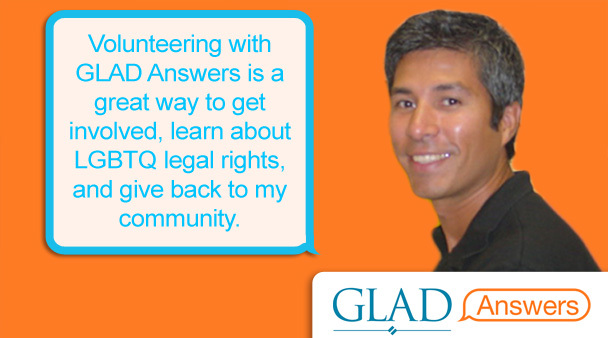 GLAD Answers is free and confidential and provides detailed information about the rights of LGBTQ people and people living with HIV in New England as well as providing referrals to other agencies and to attorneys who can provide legal advice. They are the “face” of GLAD to the public. They help the public actualize the rights that GLAD’s attorneys have won. They provide information and referrals that can help people to navigate the complex legal system and set them on a path to solving their legal problems. They are often the first person to discover an impact litigation case that the GLAD attorneys take on. So what does it take to be a GLAD Answers volunteer? That you have one weekday afternoon free from 1:30-4:30pm each week. Contact GLAD’s Public Information Manager, Bruce Bell, by phone (617-426-1350) or email (bbell@glad.org). Find more information and an application here.